You can get to Belokurikha resort by air, train or bus. Buses to Belokurikha resort depart from Biysk, Gorno-Altaisk, Barnaul, Novosibirsk, Novokuznetsk, Kemerovo and Tomsk. Follow the link below to check the timetable and ticket prices. The most convenient way is to take a train to Biysk, Barnaul or Novosibirsk and then take a direct bus to Belokurikha bus station. 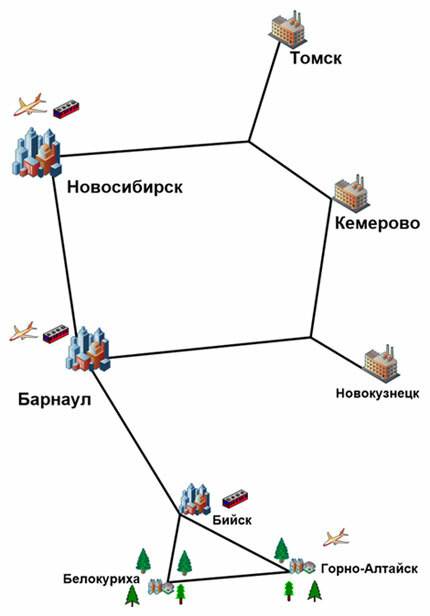 You can also fly to Barnaul, Gorno-Altaisk or Novosibirsk and then take a direct bus to Belokurikha bus station. You can take a fixed-route taxi bus from Belokurikha bus station to any hotel, holiday centre or health resort, or you can take a taxi. You can see where Belokurikha is on the map, and distances and travel times are given in the table above.